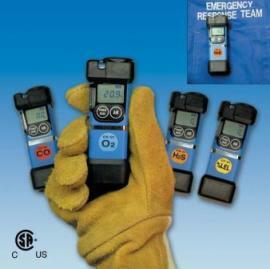 The OX-1 is a clip-on portable personal oxygen monitor with detection range from 0 – 40%, accuracy of +/-0.5% vol. Alarm setpoints: Low (19.5%), High (23.5%) and Over (40.0%). Galvanic cell detection principle. Uses 2 AAA size alkaline batteries for operation. Dimensions of 35 x 105 x 20mm and weight of 100g. Safety rating of CSA classified, “C/US”, as intrinsically safe. Class I, Division 1, Groups A, B, C, D.
Supplied with rubber protective boots, belt clip and 2 alkaline batteries.